"Do not question whether or not to try this recipe. 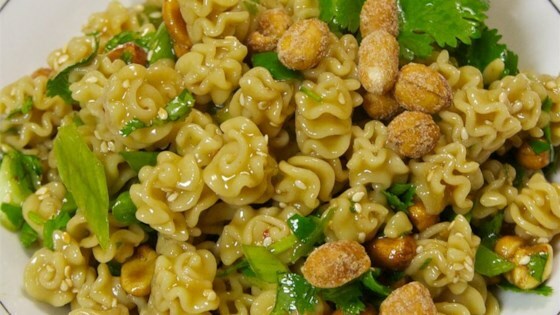 It is a nice pasta salad for any occasion that, once tasted, one cannot resist having some more." Bring a large pot of lightly salted water to a boil. Cook spaghetti in the boiling water, stirring occasionally until cooked through but firm to the bite, about 12 minutes; drain. Mix spaghetti, sesame oil, honey, soy sauce, corn oil, red pepper flakes, and salt together in a large bowl until spaghetti is evenly coated. Cover bowl with plastic wrap and refrigerate for at least 4 hours. Add cilantro, green onions, peanuts, and sesame seeds; toss to combine. A pasta salad with chicken, sesame dressing, and fresh herbs. I didn't enjoy this dish. The sesame oil and soy sauce were overpowering.